Successfully Added Rofvape Coco Vape Pen Starter Kit - Indicator Light, 0.3 Ohm Resistance, 2.3ml Capacity, 2200mAh Battery (Black) to your Shopping Cart. With the Rofvape Witcher Coco Pen in your pocket, you’ll always be able to enjoy a satisfying vape no matter where you’re at. Thanks to its sleek and stylish design, this slim-line e-cigarette is both pleasing to the eye and easy to be carried around. Simply slide it in your pocket or purse and you’ll be able to carry along this beautiful electronic cigarette any place you go. Being the preferred choice of many vapers out there, the Coco Pen allows you to engage in some pleasing vaping at any given moment without needing to carry around a bulky device. As a starter’s kit, the Rofvape Witcher Coco Pen is not just a simple e-cigarette but comes with an abundance of other little accessories such as an atomizer and two different capacity coils. Perfect for the beginning vaper out there, this vape pen starter kit is easy to use, quick to refill, and simple to recharge. Packing a built-in 2200mAh battery, the recharging is however not something to worry about as this e-cigarette will get you through countless of vaping sessions without you needing to worry about being left without juice. Thanks to its highly affordable price, this starter vaping set is perfect for all first-time vapers out there – providing you with a high quality and flavorsome vaping experience without needing to spend excessive amounts of money on an expensive e-cigarette. Thanks to its easy to use design and the numerous accessories this set comes with, this vape pen starter kit offers everything you need to get started right away. All you have to do is add the flavor juice of your liking and you’ll be all set to enjoy a relaxing and tasty vaping experience. Supporting a 2.3ml tank, you’ll be able to fill this beauty up with plenty of your favorite tasting juice – allowing you to enjoy a long lasting and flavorsome vape experience. 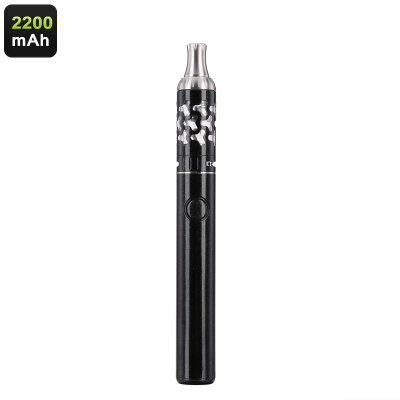 Additionally, to increase your overall experience even further, this e-cigarette features different sorts of protection that range from a 10-second cut off, to over heating and over charging protection – ensuring that you’ll always be able to safely enjoy your vape pen to the absolute most. With its simple yet stylish metal design, the Rofvape Witcher Coco Pen features merely one button – making it easy to operate whenever required. Its stylish LED indicator furthermore keeps you updated at all times about your current battery status, ensuring that you’ll never be left without juice to enjoy your favorite vapes. Additionally, this style full vape pen lets you to efficiently control the airflow by simply twisting the device – allowing you to adjust the vapor to your personal taste. Being able to produce a significant amount of vapor, this light-weight e-cigarette is a magnificent little product that provides you with an affordable and healthy alternative to regular cigarettes – making it a highly popular product to many vapers out there. The Rofvape Witcher Coco Pen comes with a 12 months warranty, brought to you by the leader in electronic cigarettes as well as wholesale electronic gadgets..